December 31, 2015 /Photography News/ The annual World Press Photo contest rewards photographers for the best single exposure pictures contributing to the past year of visual journalism. Whether entered as singles or stories, these pictures are judged in terms of their accurate, fair, and visually compelling insights about our world. The contest is organized into categories, and judged by a jury comprising leading photojournalism professionals. The membership of the jury changes every year, and is led by a chair and supported by a secretary who implements the rigorous judging procedures. The jury, chair, and secretary are independent of the World Press Photo Foundation. The staff, board, and partners of the World Press Photo Foundation are not to direct the jury’s decisions. Deadline: Registration for entries is available until 7th of January, 2016. Open to: Professional photographers and photojournalists with single exposure pictures contributing to the past year of visual journalism. Prize: All Prize winning photography are assembled to travelling exhibition in 45 countries, winning pictures are also published in a yearbook, and winners attend an award ceremony in Amsterdam, The Netherlands. October/November: Details about the contest, as well as the jury members’ names, are announced. December: The contest website opens for entries. January: The contest website closes for entries and judging begins at the end of the month. February: Winners are announced on 18 February 2016. April: All winners are invited to the annual Awards Days, a networking event and celebration of the prizewinners, which takes place in Amsterdam at the end of the month. The prize-winning photographs are assembled into an exhibition that travels to 45 countries and is seen by more than 3.5 million people each year. The winning pictures are also published in the yearbook, which is available in multiple languages, and can be purchased in ourstore. All award winners are brought to Amsterdam in April to receive their prize during the annual Awards Days, a two-day event featuring photographer presentations, talks by industry leaders, and the Awards Ceremony. Professional photographers / photojournalists can dive in the competition HERE. 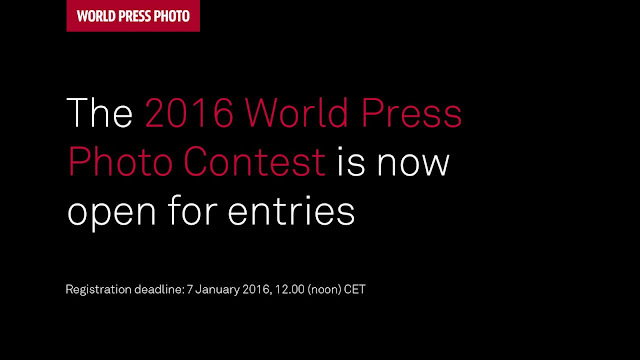 Everyone who wishes to enter the 2016 World Press Photo Contest must register for access to the entry site before 7 January 2016, 12.00 (noon) CET. Entries to the photo contest may only be submitted online via the entry site, which is now open until 13 January 2016, 12.00 (noon) CET. You can follow through the categories of the competition HERE, read entry rules HERE, and the code of ethics HERE. Questions can be directed via email to Micha Bruinvels, manager contests, at contest@worldpressphoto.org. For more information please visit the official webpage for the competition.